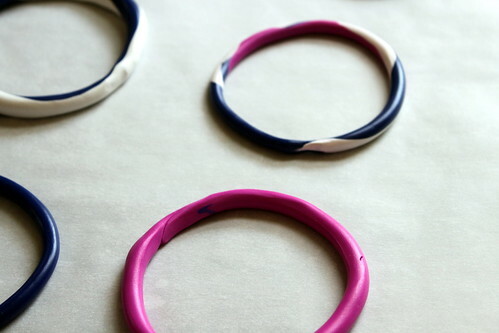 I read a million blogs and somehow I stumbled upon Delighted Momma and her DIY Bangle post on Friday afternoon and I knew what I was going to do on Friday night. 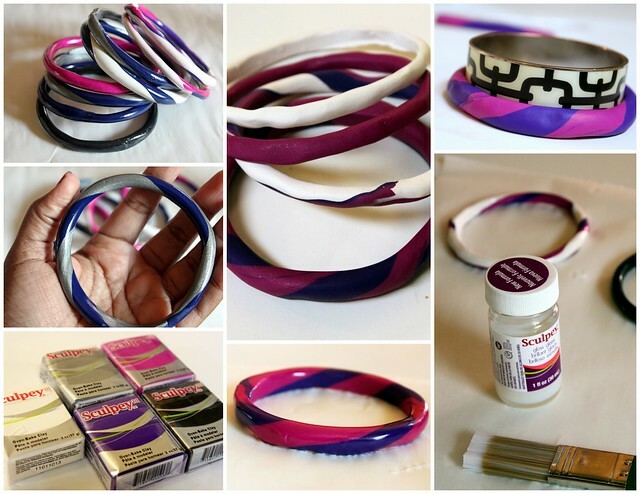 How did I not know that I could make my own bangles?! On the way home from work I stopped by AC Moore to pick up some polymer clay. It’s called clay but really it’s a moldable plastic that you bake at 275 degrees for 15 – 30 minutes depending on the type of clay you choose. 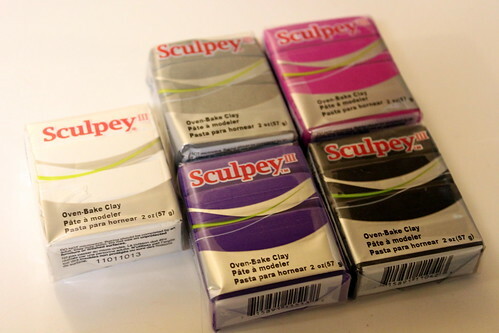 On my trip I picked up 5 packs of Sculpey III, each pack is about $2 each, I eventually picked up a pack of the Sculpey Premo and I like the consistency of it a bit more and it requires a longer baking time. You can also go to the Sculpey website to see all the different types, colors and even instructions on how to make other projects. I rolled out 1 section of the clay into a smooth log and then wrapped it around a bangle as a guide, online there are also suggestions for using a can too. If you want to blend colors you can just twist to ropes of clay together and keep rolling them until they blend the way you want them. The hardest part is merging the two ends (you want it to appear seamless) and then getting it off the guide and onto your baking sheet. I used parchment paper on my baking sheets because that’s what I put everything I bake on and I didn’t want it to stain, even though it didn’t stain the parchment. When I did a first batch of bangles I could see more of my dents and fingerprints on them, so when I did a second batch I got better. Practice makes perfect. I also thought they came out very matte and wanted a way to make them glossy. Of course there is a glaze that you can paint them with after you bake them! You can get satin finish or gloss, I went for gloss. I think you can really see the shine on them in the picture above. The gloss lets you build up the shine for how glossy you want. I did 2 coats and I think it really helped make the metallic clay look like it sparkled. This was such a fun and cute idea to make custom accessories! I loved it and will definitely make more and experiment with the colors, techniques and width in the future. Has anyone else tried this before? Anyone else interested in trying it? And if you’re interested in more pictures of the entire process, you can check out the full set of pictures on Flickr. 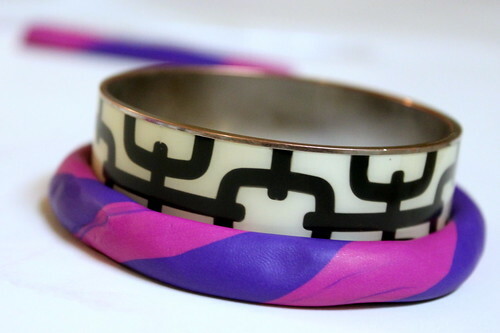 I’m obsessed with bangles so yes I will be trying this ASAP! Andrea, I have a feeling you’ll come up with some really dope designs. I am definitely going to give this a try. I think these would make awesome giveaways at my Premier home shows too! These turned out so great. Courtney, I had a feeling these might really be up your alley. 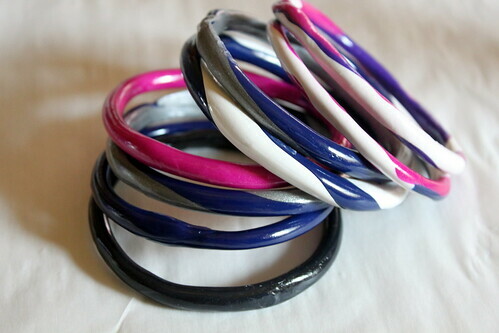 Omg, I can NEVER find bangles that fit over my wrist and THIS is a godsend!!!! I will be hitting up AC Moore TONIGHT because I love bangles and this in the answer to my prayers! What a freakin’ cool idea!!! I can’t wait to try this…we don’t have a local AC Moore hopefully I can find this stuff in Michaels. Roni, you can find it at Michael’s, Jo-Ann’s, pretty much any craft store in your area should carry that kind of clay. AC Moore just had a huge selection online so I decided to go there. Way to go!! They turned out beautiful and I love the color combinations you used! So pretty. AWESOME idea. I will definitely give this a try! Thx! Nik, I have to give created to Delighted Momma. I linked to her original post and I’m so glad I stumbled upon her blog! This is amazing! I can’t wait to try this! Thank you so much for sharing! Katie, if you try it send me pics/link. I’d love to see what you come up with! WOW! This looks like SUCH fun 🙂 Thanks for the cool idea and tips. Kristine, you are very welcome. Ok – these are AMAZING!! I love how you took this camp-type craft and made it oh so chic and fun. Now I need to find a craft store and try this myself!! LOVE LOVE! Pretty craft! It’s so easy to do and yet the outcome is so fabulous. My cousin is a chic girl and I think she’d appreciate a homemade craft like this. Would it be still possible to shape it with more thick bangles? I mean, would it affect the durability? Kudos, lady – those are GORGEOUS! Making some of these right now! I am loving this idea. Thank you for sharing!!! !